Our shop carries almost 7000 products, including vitamins, herbs, homeopathy, sports supplements, natural body care, essential oils for aromatherapy and massage, gluten-free and other allergen-free foods, fresh organic produce, and pet options. Our customers especially love our healthy refrigerated and frozen food selections, including our shoppe-ground nut and seed butters! We also have a community section that offers local publications and information about wellness practitioners and local businesses. Rather than listing everything for you, we thought it’d be better to show you our shop right here on our website! As a Loyalty Cardmember, you save every time you shop with us! Michael Dworkin, PD, CCN, greatly valued the importance of offering high-quality, affordable nutritional products in the shop and through his clinical practice. In 1970, he developed the Manchester Parkade Health Shoppe brand line of dietary supplements. So, what’s the value? Why buy our affordable brand versus a national brand? Here are some facts to help you learn why we developed these effective products. “Vitamins and herbs” doesn’t quite capture the full range of products you’ll find in this aisle! Our Customer Care staff will guide you to the specific products you’re looking for. We categorize and label sections both by brand and what you’re looking to achieve, whether it’s to increase your energy, boost your immune system, or improve your digestion. 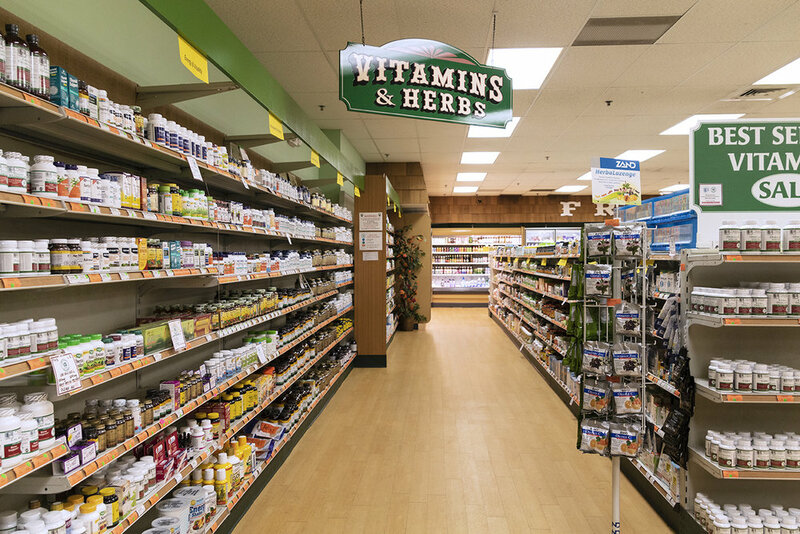 This is where you’ll find our clinically-tested store brand supplements and refrigerated probiotics and foods. You are bound to find something ideal for you that will help you feel better and live a healthy lifestyle! We carry leading national brands for all of your head-to-toe natural body care needs. From hair to skin to feet, we have all the oils, shampoos, body lotions, remedies for aches, pains and skin, and makeup you might need! Our Customer Care staff will be happy to help you find and choose products best suited to your body. When you walk down this aisle, be sure to have a shopping basket with you! From organic, dairy-free chocolates to healthy allergen-free snacks, and Asian and meal prep items, you’ll find something for every mood & need. Continuing your food shopping experience, Aisle 4 has our in-store fresh ground nut and seed butters, local herbs and spices, and a huge selection of herbal teas, coffee, and coffee substitutes. We have organic raw apple cider vinegar, local honey and maple syrup, a large variety of coconut oils, and much more. Don’t forget to check out the ingredients in Kyle’s Daily Digestive Health Tonic! 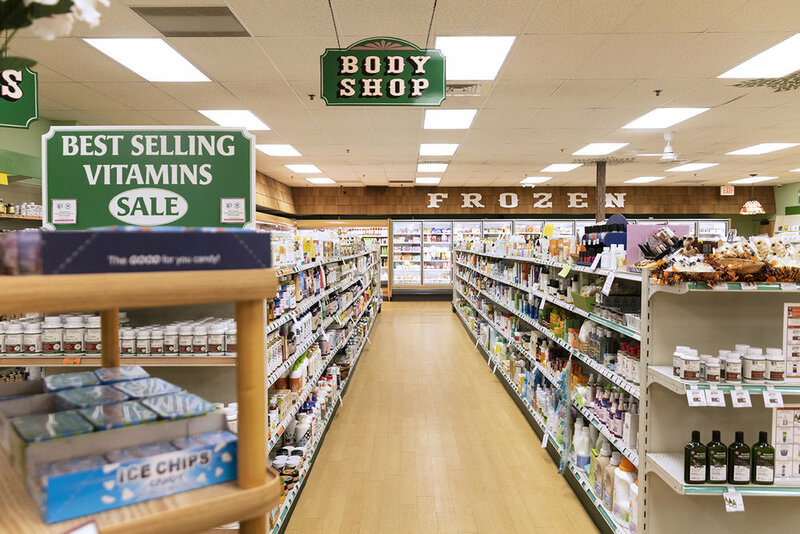 Aisle 5 is where you’ll find a wide range of products, including sports supplements, top-brand vegan / whey / egg / beef protein powders, bone broth protein, medical-grade collagen, and health books. You’ll also find here a great selection of meal replacement shakes, specialty waters, juices, a large number of aloe vera brands, and milk alternatives such as almond milk. Our frozen section at the back of the store offers 11 freezer doors filled with a large range of frozen foods, including gluten-free and other allergen-free ready-made meals, frozen fruit and vegetables, and various non-dairy ice creams and other desserts. You’ll also find more affordable, fresh, organic produce! Time to check out! We have filled the front of our store with items easy to grab at the last minute. You’ll find a great selection of affordable organic produce, a wide selection of protein bars and other snacks, essential oils (including ingestibles), aromatherapy diffusers, non-toxic local beeswax and soy candles, smudging sage sticks, incense and flower essences. Our Customer Care staff is here to help you check out and find anything you might have remembered last minute!